Portable device can be used in home, rather than hospital, and can be worn for treatment anytime, anywhere, including work. 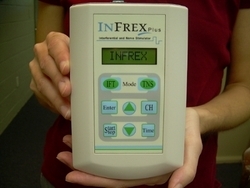 The Infrex Plus unit means those individuals suffering from agonizing pain can now self-treat without the use of narcotics, at home or work, on an as needed basis. MedFaxx has announced the release of the first FDA approved, insurance reimbursable unit that combines the most used form of electrotherapy in the world clinically for chronic pain, interferential with TENS (transcutaneous electrical nerve stimulation) which is the most used form of electrotherapy for chronic pain outside the clinic. The Infrex Plus unit means those individuals suffering from agonizing pain can now self-treat without the use of narcotics, at home or work, on an as needed basis. Historically interferential (8,000+ pulses per second) was only used for patients in a clinical setting. Each session cost the patient or insurance company for each treatment. The benefit of interferential is immediate pain relief that provides 'carryover' pain relief that can last for hours, days, and sometimes weeks. With the release of the new combination unit a patient can treat at home, work, or wherever pain starts, whenever it starts. The patient is no longer dependent upon scheduling an appointment, being denied treatment by the insurance company, or having to take time off from work to get relief. The new unit is small enough, yet powerful enough, for the patient to wear/carry and use during breaks or on the job to self treat to. The overall savings from missing work will be in the mega millions of dollars for the employer and employee. Bob Johnson of MedFaxx Inc. said: "The Infrex Plus unit means those individuals suffering from agonizing pain can now self-treat without the use of narcotics, at home or work, on an as needed basis." The breakthrough is the result of new-patented engineering technology that allows the use of portable, rechargeable batteries that can sustain enough energy for the patient to receive up to two treatments using only the battery system. In most settings, it is preferred the unit be plugged into a wall outlet with the AC adaptor. The engineering efficiency of using either batteries or AC adaptor means more patients can stay on the job, be active with their families, and not worry about the onset of crippling pain. Interferential is not new. It's been around since 1951 but has been regarded as "experimental" by Medicare even though it is the most effective form of electrotherapy for pain in the world. Due to the classification, Medicare patients had to be treated with interferential only in clinical settings. Medicare would deny the purchase of an interferential unit, even though the patient's pain was resolved. The new Infrex Plus unit solved this problem by combining a Medicare approved unit, TENS, with the interferential mode into one unit so a patient can choose which treatment is best and have the unit paid for by the insurance company, including Medicare. The overall savings to the U.S. health care system will be significant. Patients can obtain relief without having to go to clinics. This dramatically reduces the cost of chronic pain management to patients, insurance companies, and Medicare. The company, MedFaxx, offers a free trial of the Infrex Plus unit, for the patient to determine its efficacy before any purchase is made. During the trial, the company consults with the insurance company to make sure coverage is provided and if not MedFaxx will work with any patient to insure the patient is treated. More information can be obtained by visiting the website, http://www.medfaxxinc.com or by calling Bob Johnson at 800-937-3993 - 9 a.m. - 5 p.m. EST.